You can spend hours and hours making the most beautiful gum paste sugar flowers only to find that hot/humid weather conditions are out to destroy all your hard work so I am passing on my own experience and tips from friends that may help you. I started my gum paste flower making, cake making and decorating career in England where it is rarely too hot or too cold, and I can’t ever remember considering humidity. Weather conditions are a concern for a lot of decorators and to what extent, depends on where you live. However, since moving to central Europe several years ago, where it can drop to -15C in the winter and rise to over +40 C in the summer and the humidity can fluctuate, I am now experiencing some of the issues that are a major problem for a lot of people. Before I tell you how I cope with making sugar flowers in the heat and humidity, I am going to tell you how I deal with them when it’s cold. My kitchen is heated in the winter to a temperature that it is comfortable to work in, but when it is very cold outside, I find that the gum paste can sometimes become very stiff and hard to work with. It’s fine once the heat from my hands softens it but to start it off I often resort to a practice that needs to be very carefully done or risk ruining the paste. I give it a blast in the microwave oven, but only for just 3 seconds at a time, testing it each time, until it is soft enough to work with. Leave it any longer in the microwave, between each testing; then you may not catch it when it is just right, and the sugar will overheat, and apart from burning your hands badly when you try to use it, chances are it will be useless. I always have cold hands in the winter, even in the warm kitchen, so I frequently put them in warm water to heat them but I make sure I dry them thoroughly before I touch the paste or excess moisture will ruin the consistency. Another thing I do is to put a thick towel over the radiator and leave the paste I am not using on that, tightly double wrapping it so it doesn’t dry out. I have not had any problems in any weather conditions with this Gum paste recipe. However, a friend has given me this recipe she uses that seems to cope with the extreme weather conditions that occur where she lives. The instructions below are for making gum paste with a table stand mixer. The paste is not suitable for making with a hand mixer because it is very stiff and would most likely burn out the motor. However, there is absolutely no reason why you couldn’t make this by hand if you knead it well to make it smooth. Sift the Gum Tragacanth/Tylose and the cornflour/cornstarch together and add slowly to the mix. Turn the mixer to a slow speed and mix until the ingredients are combined, scraping down the sides of the bowl as required. Tip the mixture onto your bench and knead in the potato starch until it is smooth and elastic. Double wrap in food grade plastic and leave it to rest for 12 hours before using. After resting, if you are not going to use it immediately, divide it into smaller pieces, double wrap them in plastic wrap, place in freezer bag or box and store in the freezer. To use the paste, leave until it reaches room temperature then knead well before use. If you are wiring your gum paste flowers, then you must make sure that you make a hook at the end of the wire before you attach it to the center of the flower. Don’t just slide it into the center and hope for the best; you must make sure it is anchored securely into the paste. That way there will be little chance of it coming out if the flowers are in a humid atmosphere. If the atmosphere is likely to be hot and humid on the day you require your decorated cake you really need to make the flowers well in advance so they can be thoroughly dried. The best way to see your flowers collapse is to put them on a cake when the centres of the flowers are not properly dried, especially if the flower is large. 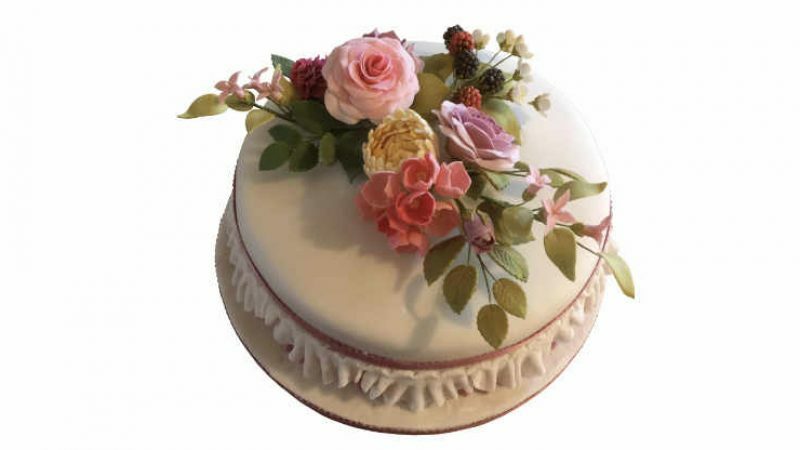 If you are going to make a cake for a special occasion, e.g., a wedding cake, then you will usually have plenty of notice so you can make the flowers well in advance, so they have plenty of time to dry properly. However, there will always be a cake needed in an ‘emergency,’ so the best advice I can give you is to have some well dried, white flowers, or flowers in the colors you use most, stored away for those occasions. You can always color them with petal dust when they are needed or airbrush them with gel paste diluted with vodka, so they dry quickly. If you continuously experience problems with drying gum paste sugar flowers and you make quite a few, a good investment would be a worktop dehydrator. Place petals or whole flowers in the dehydrator on low heat. 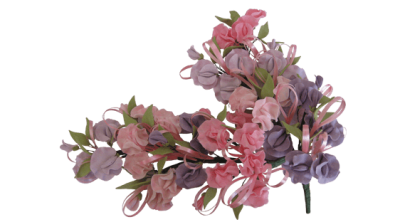 Petals can take as little as an hour to dry, and whole flowers may have to be left overnight to dry thoroughly, depending on how big they are. A dehydrator is not expensive, and it works well. You could also place your flowers on a tray, put them into an oven set to warm, with the door slightly open, and leave for several hours until dried right through. Once the flowers are dry there is always the chance that if it is too humid then they will begin to absorb moisture, become sticky, droop, and worst case scenario, fall apart. If I think there is a chance that will happen then I paint each flower with two coats of confectioners glaze, letting it dry between coats. I know you can get the glaze in an aerosol spray but because I can’t cope with the smell, I prefer to paint it on, and after I have finished I clean the brush with confectioners glaze cleaner. It works for me, and I do remember reading somewhere that one of the TV cake makers suggests using it, but I can’t remember who it was. I decided to try to see how effective it was in extreme humidity, so I painted a couple of flowers with two coats of glaze, letting them dry between each coat then held them in the steam of a kettle for a couple of minutes. They got slightly sticky but didn’t fall apart, and once I removed them from the steam, within a few minutes they dried, and I couldn’t tell that anything had happened to them. That was very extreme, so I suspect they would stand up to a lot of heat and humidity under normal circumstances. Flower makers usually use confectioners glaze just to make their flowers shiny, but some say that it makes white flowers slightly yellow. I have not experienced that, but if you have and you need to take precautions against heat and humidity, perhaps the answer is not to make white flowers. 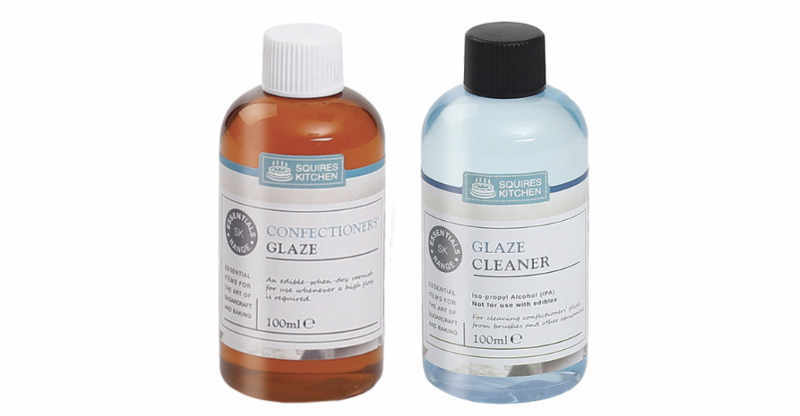 Confectioners glaze is an edible, clear varnish that’s made from shellac which is a natural substance that is mixed with alcohol and evaporates immediately its exposed to the air. It is sold in a brown tinted bottle which keeps the glaze from taking on a yellow tint. Sweets such as M&M’s are coated with shellac which kids eat all the time, so it is not harmful. Once your flowers are dry, don’t put them on the cake until the last minute – if you are delivering the cake, if possible put them on the cake when you get to the venue. If you are fortunate enough to be able to make them ahead of time, then they will need to be stored until you need to use them. The easiest way to store them is to place them in a large airtight box with some sachets of silica-gel which you can get from a craft shop or from Amazon. I then usually place the box in a brown paper bag or a dark coloured box so the light doesn’t fade the colours. There is no need to store them in the fridge or the freezer, just leave them in a cool place until you need them. The silica will absorb any moisture left in the flowers and will keep them perfectly dry until you need to use them. I have flowers I made 30 years ago, and they are still perfect. I have also read that you can use products such as ‘Hippo Moisture Absorber’’, “Damp-Rid”, or uncooked dry rice scattered in the bottom of the box. In other words, anything that absorbs moisture that works for you is the answer. Someone even suggested using cat litter, in the bottom of the box, covered with paper to absorb moisture but seeing that sugar absorbs smells I am not sure if flowers smelling of cat litter disinfectant would be acceptable on a cake. I hope this information is helpful, but trial and error may be the only way that you can find out what works for you where you live. In my blog post about Fillings & Frostings that will stand up better to extreme weather conditions, you will find recipes that are easy to make, are delicious and are easy to use.